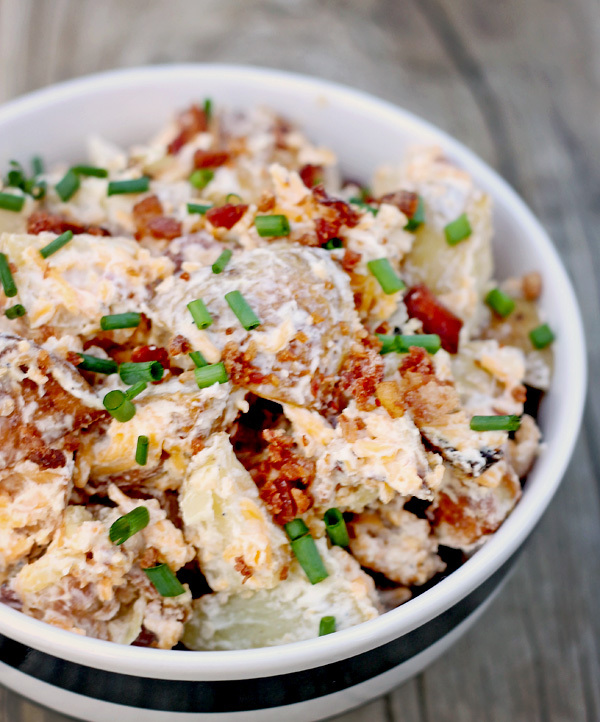 Potato salad is a summer staple – especially in the south. 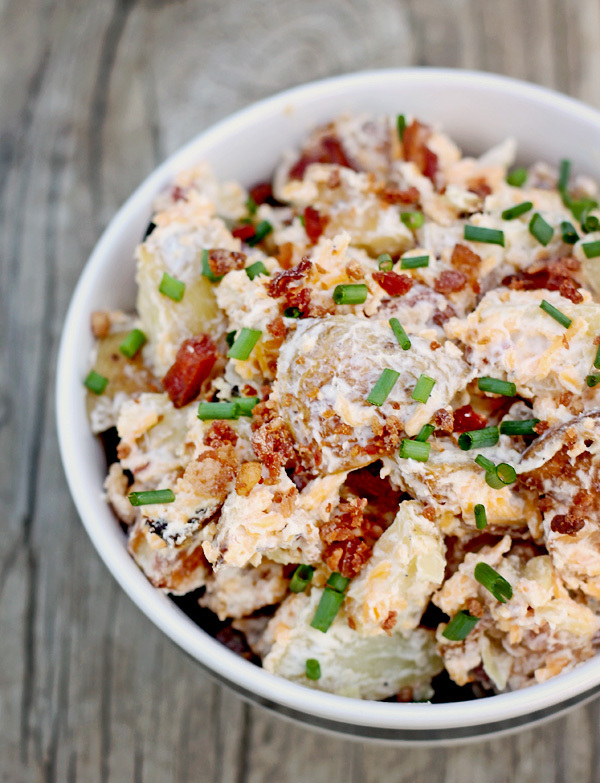 We like all kinds of potato salads, but my family’s favorite is loaded baked potato salad. I’ve always made it the traditional way of boiling potatoes and then adding in the “loaded” ingredients, but one day I decided to bake the potatoes instead – and it was so fantastic that I decided to share it with you. This recipe is perfect for cookouts and get togethers – and it’s especially great because there’s no mayo. Directions: Start by preheating the oven to 350 degrees. On a baking sheet, roast the potatoes by coating them in olive oil, then sprinkling with the salt and pepper, work it all together so the potato pieces are coated well, then roast 30-35 minutes or until the potatoes are cooked (check with a knife for tenderness.) Let the potatoes cool for 5 minutes while mixing together the other ingredients in a mixing bowl, the butter, sour cream, bacon, chives and butter, then mix in the potatoes once all incorporated. Let the potatoes cool for 5 minutes while mixing together the other ingredients in a mixing bowl, the butter, sour cream, bacon, chives and butter, then mix in the potatoes once all incorporated. It’s just like eating a loaded baked potato – yet in salad form. 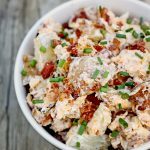 Even folks who swear they hate potato salad tend to fall in love with this version. This looks so so good! Pinned and trying it out! Seriously love my potatoes. Thanks for the recipe Gina! oh, great. now I’m starving! thanks for the recipe (and the extra five pounds). Hi Gina, do you know how many this recipes feeds? Would love to take it to a potluck and am trying to figure out if I need to double it. People say this looks good or great , but it is amazing. I had come across it made in house at Kroger, and I gave it a try. I should have asked for all of it. 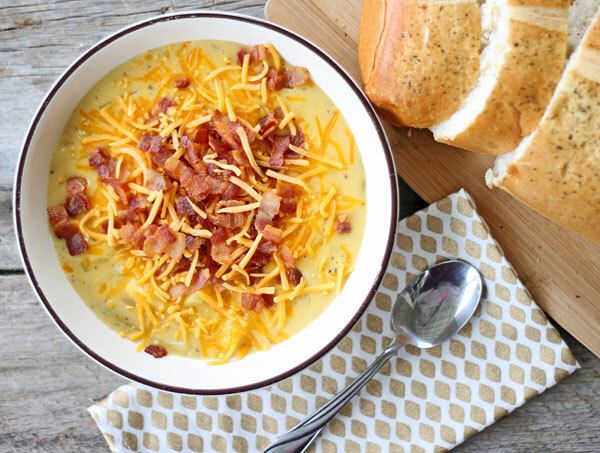 Overall AMAZING and you will save a ton making it.